The day couldn't have started in a worse way for the Merengues supporters, following an official announcement made by Real Madrid, confirming that Cristiano Ronaldo had gone through a physical examination and that his injury might be more serious than what was initially thought. The extremely short medical report was published in Real Madrid's official website and even though it only states that Ronaldo has suffered a left biceps femoris muscle injury, Sanitas (the medical company that works with Real Madrid) didn't risk throwing any prognosis in terms of the recovery period that is expected for CR7 to go through before coming back to the pitches. According to several other sources in Spain though, it's not likely that Ronaldo may be fit for any game within the next 2 weeks, which would mean he could miss the Clasico, in the Copa del Rey's final against Barcelona right next Wednesday and would also be in doubt for the UEFA Champions League semi-finals first leg, scheduled for April 22 or 23. This take us to our point: Can Real Madrid be accused of having been careless in the way they conducted this whole injury process? Why has Ronaldo only gone through these more accurate physical examinations this past Wednesday (April 9), when everyone knew he had been struggling to be fully fit for quite a while already. Did the club overlook or ignore the potential of the true extent of the injury, because perhaps Ronaldo himself led them to think there shouldn't be a reason to be worried, or did this happen for any other particular reason? This was Carlo Ancelotti's statement to the press, on March 28. Ancelotti: "Cristiano Ronaldo has a minor injury, which is not bothering him at all. He has been training without limitations, at the same time he has been receiving the proper medical treatment he requires. We did think about resting him recently, but he doesn't need that at this stage. 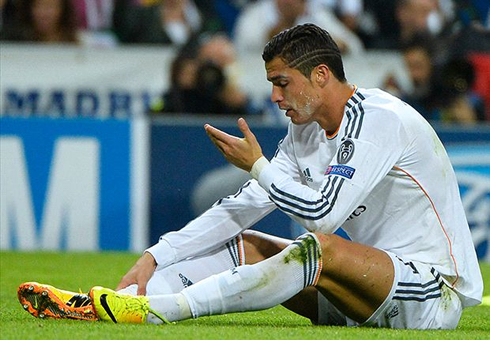 His knee is being treated and Ronaldo certainly doesn't regret to have played against Sevilla. Moreover, I'm sure that the problem will be solved in the next days..."
Roughly two weeks later from that day and the diagnosis is now completely different. Hopefully the injury is now being taken cared as it should have been right from the start, so that Ronaldo may fully recover not only for the decisive stages of Real Madrid season, but also for next Summer's FIFA World Cup in Brazil, where he'll definitely be Portugal's biggest hope to come home after a successful campaign. 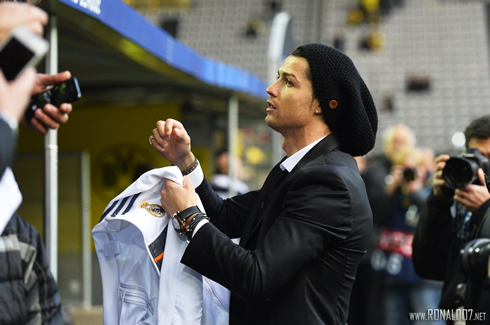 Cristiano Ronaldo next game for Real Madrid will be against Almeria for the Spanish League 'La Liga', on April 12, 2014. Even though Ronaldo is not expected to be playing, you can still watch Real Madrid vs Almeria with us, as well as Granada vs Barcelona, Liverpool vs Manchester City, and Wigan vs Arsenal, all games provided from our soccer live section.